A great solution for those who need heavy-duty pollution protection—including joggers and cyclists in smog-ridden areas, people who work with chemicals, and environmentally sensitive consumers. Carbon-activated filter protects against chemicals, dust and other fine particles, pollen, smoke and odors. 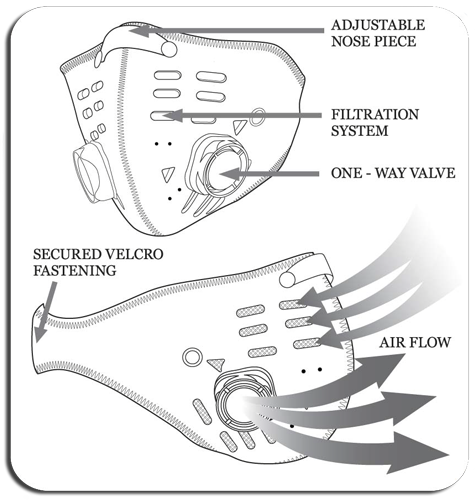 The two valves are designed to improve airflow performance on exhalation. (Click here for diagram.) Filter lasts for approximately four months if worn daily. Washable navy-blue Neoprene mask wraps around back of neck with Velcro; adjustable nose piece. Only Extra Large left in stock; fits larger-boned and tall people (over six feet). 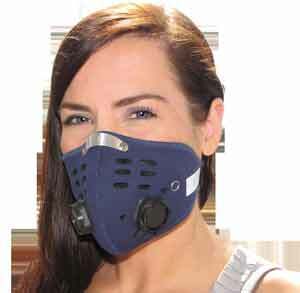 All Filt-R Masks are closeouts and not returnable. This product is no longer being manufactured, and refills are not available.